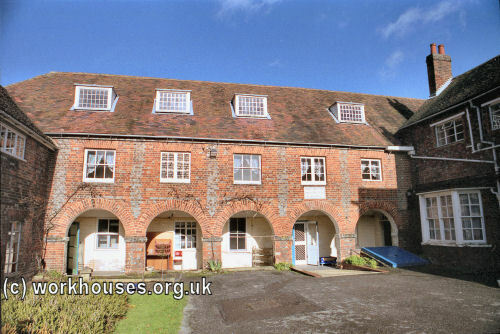 A workhouse to accommodate 150 people was built at West Hill in Henley in 1790. 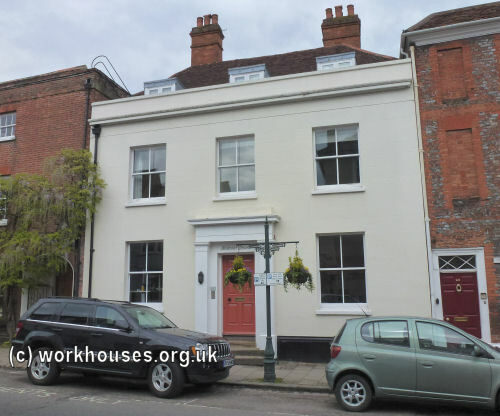 Almost half a century later, this building was to form the basis of the Henley Poor Law Union workhouse. 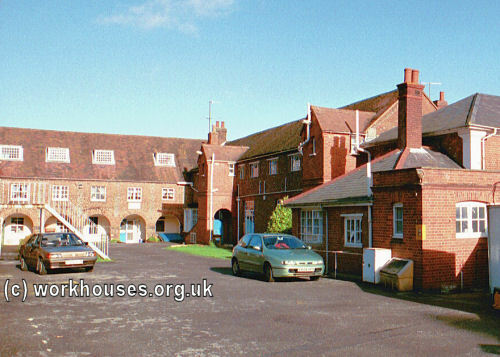 Henley old workhouse entrance , 2000. 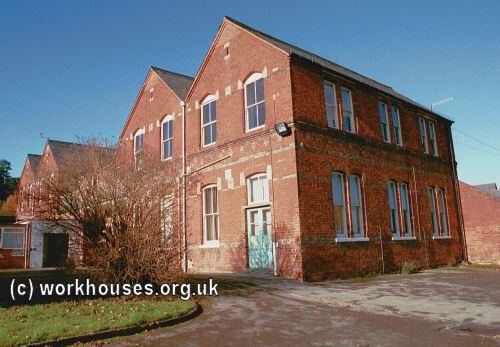 The workhouse had a "pest-house" which was used for the confinement of infectious cases. In 1794, the 22-year poet Samuel Taylor Coleridge was an unwitting resident of the pest-house. Having run away from Cambridge University where he had accumulated debts, Coleridge joined the Light Dragoons at Reading under the name of Silas Tomkyn Comberbache. When the Dragoons discovered he was totally incapable of riding a horse, he was seconded to Henley and given the job of nursing a fellow recruit who had caught smallpox. The two men were confined in a small chamber for eight days and nights in foul conditions. Coleridge's time in the claustrophobic pesthouse may have contributed to the imagery in the Ancient Mariner. Henley former Pest House, 2014. Oxfordshire: Bix, Brightwell, Britwell Prior, Britwell Salome, Caversham (2), Checkendon, Cuxham, Eye and Dunsden, Harpsden, Henley (4), Ipsden, Nettlebed, Nuffield, Pishill, Pyrton, Rotherfield Greys (2), Rotherfield Peppard, Shiplake, Swyncombe, Watlington (2). Later Additions: Badgemore (from 1894), Greys (from 1894), Kidmore (from 1894-1902), Kidmore End (from 1902), Stonor (from 1896). The population falling within the union at the 1831 census had been 14,651 with parishes ranging in size from Britwell Prior (population 52) to Henley itself (3,618). The average annual poor-rate expenditure for the period 1832-35 had been £12,477 or 17s.0d per head of the population. 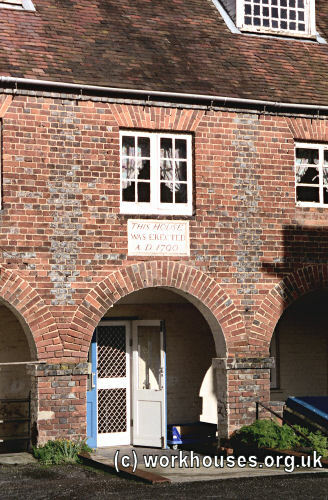 At its inaugural meeting on 16th June 1835, the new Henley Board of Guardians appointed a committee to negotiate with the town council on taking over the old workhouse building. The council eventually agreed to lease the building and site for £80 a year. 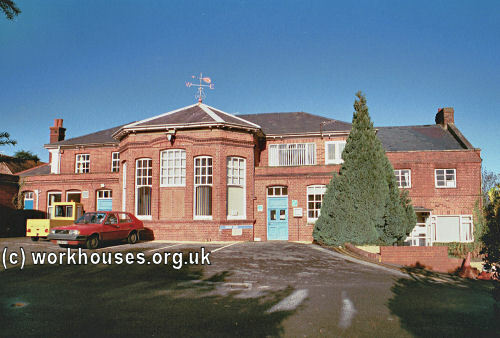 The buildings were enlarged to accommodate 250 at a total cost of around £4000. The additions included a board room and clerk's office, and new receiving wards. The layout of the workhouse site can be seen on the 1879 map below. The board-room and clerk's room from the south, 2000.
Henley dining-hall block from south-west, 2000. In March 1840, an outbreak of "contagious fever" halted admissions to the workhouse. In the wake of this, an infirmary was built along the northern edge of the site, to designs by Mr Billing, an architect from Reading. The Poor Law Commissioners criticised the plans for having no water closets or bathrooms, stairs that were too steep, and a roof of unsafe construction. In reply, Mr Billing said he could easily modify the plans and include WCs and bathrooms "should they be considered necessary by the Guardians". A tender of £417 for the building's construction from Mr Outhwaite was accepted. The four-ward infirmary was completed by the end of 1841. In 1842, Mr Brooks was appointed Medical Officer for the Henley District at a salary of £110 which was to include attendance at the workhouse and its infirmary which could now accommodate up to 276 inmates. Further improvements were made to the infirmary in 1850, with a paid nurse being employed for the first time at a salary of £10 a year plus rations. The first master of the union workhouse was William Jackson who was a churchwarden and had previously been a local overseer of the poor. In 1848, the post was taken over by Samuel Mortlock from London, with his wife Ann as workhouse matron and their son, as clerk. Mortlock was to remain master for more than thirty years — a brief account of his life has been researched by Robert Griffiths. 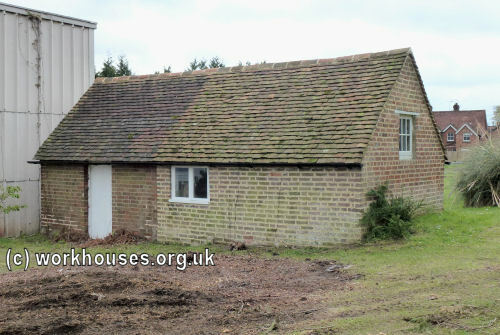 Schoolrooms were added at the east of the site in 1873. These were converted into an infirmary in 1906. New receiving wards and a mortuary were added in around 1909. The workhouse became a Public Assistance Institution in 1930, and following the introduction of the National Health Service in 1948 became Townlands Hospital which today serves as a general hospital for the area. By 1908, the Henley Union had established a children's homes at 'Radnor House', 35 New Street, Henley, which could accommodate 18 children. Another home was later opened at 'Belmont House', 23 New Street, with 12 places, although this had closed by 1929.
Henley Union former children's home at 23 New Street. Samuel Mortlock, Master 1848-84 — an account of his life by Robert Griffiths. Oxfordshire History Centre, St Luke's Church, Temple Road, Cowley, Oxford OX4 2EX. Holdings include Guardians' minutes (1835-1928) etc.